There are 30 patterns in here, many designed by the designers whose work you know and love from this very magazine. Some of the patterns were originally published in this very magazine, and where possible or appropriate, the designers have restyled or added more sizes to the book version. There are many patterns you have never seen before. There's a learn-to-knit section in the front with illustrations and detailed text which I hope is of use to the reader. The illustrator of this book, Erica Mulherin, is really good at what she does. The book is spiral-bound, easel format, so it stands up in front of you as you knit. It's my first book and I'm really excited about it. It will be in stores at the end of September. Only you can tell if you like it enough to buy it. I hope you do. Scarves are everywhere. Understatement. It's the easiest thing to knit, theoretically, since we're talking rectangles and the relative unimportance of gauge, for a change. 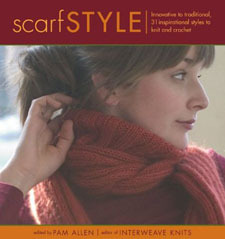 How nice that Pam Allen's book is absolutely not what you'd expect for a book about scarves. Or, perhaps, what you'd hoped for. Pam's worked with a collection of designers who have each interpreted the concept of "scarf" in a very different way. There are cables and fair isle and lace and beads and sideways knitting and entrelac and the best shrug ever [thanks to Teva Durham] and ruffles and capelets and wraps and tassels and knotted fringe and i-cord. Pam's contribution is a romantic ruffled-edge capelet with sleeves. Yummy. Very few rectangles in this book, but a lot of delightful surprises. If I were a mom, which I'm not, and my daughter were going off to college, I'd give her this book to take along. It teaches some very necessary life skills. There are stain removal tips in this book, people. And yet it's okay. Cause you need to know how to get stains out unless you want to have to buy new stuff all the time. See, the message of this book is that it's okay to care about the place you live -- to be domestic and crafty and nurturing, even if just to yourself. It teaches you how to make cool stuff, the finer points of trash picking and curbside gleaning, and how to host a party. But not in a Better-Homes-and-Gardens way. More a Martha-meets-Bust manner. Have fun but there's no need to be a slob about it. The subtitle is Hip Home Ec, and I'd have to say it's right on. 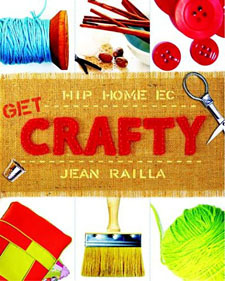 This book is more about making a home than about mere craftiness. I quite like it. I'm a vintage freak. I suppose it's up to interpretation if I'm vintage or a freak for vintage things, but let's say it's the latter, shall we? 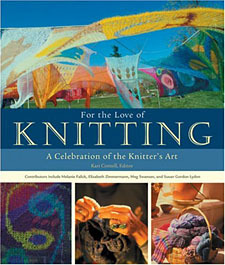 This book is a collection of essays from knitters. But at first glance, my favorite part are the vintage elements...pictures of old knitting patterns, posters, portraits and propaganda. It adds a pleasant ambience to the written word and the accompanying pictures of process and product. Hmm. A lot of Ps. And in this case, the essays are something worth savoring slowly, coming as they do from knitter/writers like Melanie Falick, Pam Allen, Elizabeth Zimmermann and Meg Swansen. One of the pieces was originally submitted to this magazine, but I didn't move quickly enough and Suzyn Jackson's excellent story about knitting in transit made it in to this collection instead. I like the book. I'm savoring it slowly. 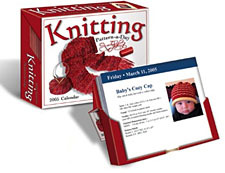 Something new...a calendar with [almost] a knitting pattern for every day of the year! And as a first knitting project from a non-knitting company, it's quite a good start. The patterns come on individual paper sheets in a box that also acts as a stand. The paper is quite thin, and may not stand up to much handling, but should do if you're careful. The patterns vary wildly in quality and style from very professional to very homemade-looking. The quality of the photographs similarly varies. 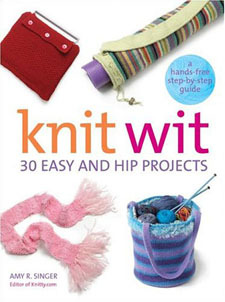 But there are some sweet projects in here, including little hats, basic sweaters and lots of little knitted things. December is full of the obligatory red-and-green projects of all sorts. Scarves, socks, vests. All sorts. No -- it's not a knitting book, and can't be judged as such. But as a calendar, it's quite fun to see what's next each day and if you'd want to knit it. And having corresponded with the publisher, I'm encouraged that their 2006 version will be even better. Don't tell me you're not knitting any big yarn. Or novelty scarves. You're human; even if you haven't yet, you'll give in at some point. I have. 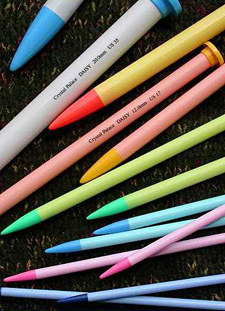 And I've found few needles that are tolerable to work with. Most big needles are heavy and often nasty to knit on. Unwieldy. These new Daisy needles are hollow plastic, and about as good as one could hope for. I mean, really, they weigh almost NOTHING, but aren't flimsy. Each size is a different color, and the girlie girl in me loves that. Also makes it easier to match the pair up when your glasses are somewhere else. Do you make or sell cool stuff you'd like to see reviewed in Knitty? Write Amy.